Earn 4.125 Creds Per $ Spent at Catwalk ? 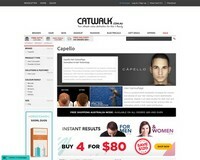 Get this deal now at Catwalk Or Join for free to earn eligible Creds! Hair Maker in Salt Shaker 4 for $80 only!